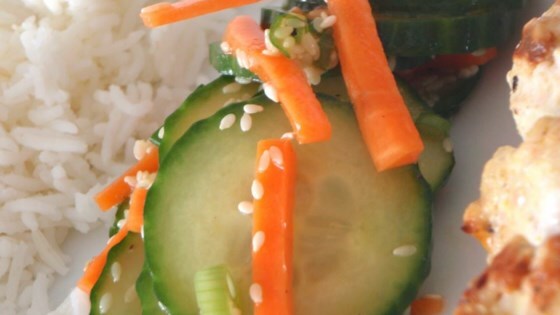 "When I lived in Korea, I was shown this Korean Cucumber salad, made with cucumbers, green onions, and sesame seeds. Goes good with Bulgogi (Korean Barbecued Beef) from this site!!" This is excellent. The second time I made it I used sesame oil instead of vegetable, Rice vinegar and added some Gari (pickled ginger) Brought it to work and everyone raved! This was great. I used rice vinegar, sesame oil, and garlic chili sauce instead of white vinegar, vegetable oil and red pepper flakes. It turned out perfect!